The G7 group of rich countries urged all parties "to immediately halt all military activity". The UN Security council issued a similar call. Khalifa Haftar, leader of the self-styled Libyan National Army (LNA), has ordered the advance on Tripoli. Reports suggest there is fighting near the international airport to the south. Tripoli is the home of Libya's internationally recognised government, which has the backing of the Security Council. 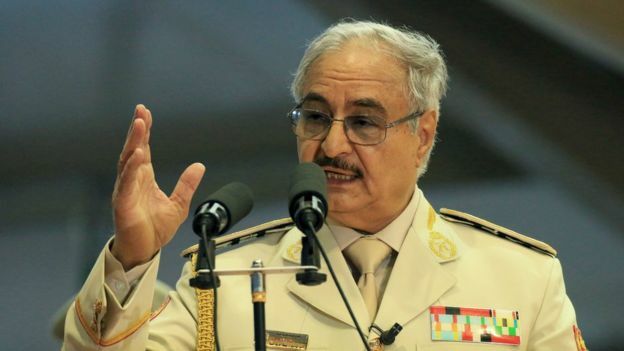 Who is military strongman Khalifa Haftar? UN troops in the city have been placed on high alert. Violence and division have riven Libya since long-time ruler Muammar Gaddafi was deposed and killed in 2011. The LNA's leader Haftar ordered his forces to advance on Tripoli on Thursday, as UN Secretary General Antonio Guterres was in the city to discuss the ongoing crisis. Gen Haftar spoke to Mr Guterres in Benghazi on Friday, and reportedly told him that his operation would not stop until his troops had defeated "terrorism". 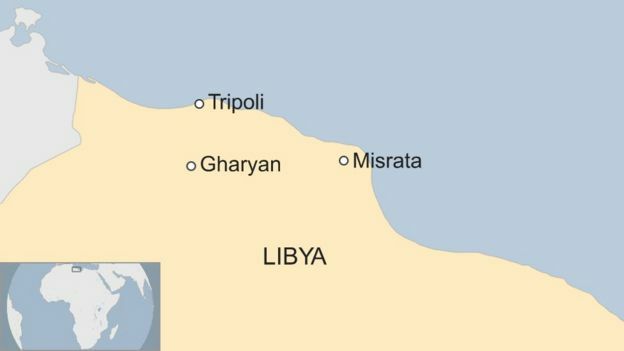 On Thursday, LNA forces took the town of Gharyan 100km (62 miles) south of Tripoli. There are now reports troops have taken the capital's airport, which has been closed since 2014 - although these are disputed. Residents of Misrata east of Tripoli told Reuters news agency that militias from their city had been sent to defend the capital. Armed groups allied to the Tripoli government told the news agency on Friday that they had taken a number of LNA fighters prisoner. LNA troops seized the south of Libya and its oil fields earlier this year. In a tweet, Mr Guterres said he left Libya "with a heavy heart and deeply concerned", saying he still hoped there was a way to avoid a battle around the capital. The G7 later responded to the fighting with a statement urging an end to military operations. "We strongly oppose any military action in Libya," the statement read, reiterating their support for UN-led efforts to bring elections and calling on all countries to support the "sustainable stabilisation of Libya". The UN Security Council held a close-door meeting late on Friday. Afterwards the German UN ambassador Christoph Heusgen said members had "called on LNA forces to halt all military movements". "There can be no military solution to the conflict," he said. A Russian spokesman earlier told reporters the Kremlin does not support Gen Haftar's advance and said it wants a solution by "peaceful political means". A conference was planned in Libya later this month for talks over ending the country's long-running crisis. Hope dashed for a political resolution? Khalifa Haftar's forces have met with mixed fortunes. To the south, they appear to have got close to the outskirts of the capital, at one point claiming to have taken the airport. But to the west, they appear to have been pushed back. It's still unclear how much this is a show of force to bolster Gen Haftar's position or a genuine effort to seize Tripoli. He returned during the revolution and he's subsequently become the most powerful military leader in a country rife with militias, allied to a rival government in the east. Despite the chorus of international concern over his actions, he has had support from powerful outside players, including the UAE and Egypt. Efforts towards a political resolution for Libya have foundered time after time. The most recent hopes may once again have been dashed. A former army officer, he helped Colonel Muammar Gaddafi seize power in 1969 before falling out with him and going into exile in the US. He returned in 2011 after the uprising against Gaddafi began and became a rebel commander. In December Haftar met Prime Minister Fayez al-Serraj from the UN-backed government at a conference but refused to attend official talks.